Probably the favorite part of my day is reading and discussing current events with my kids. At some point during the morning—we often shoot for first thing, but that doesn’t always happen—I gather the kids and we read the bible together and pray. Sometimes we read something else, like a passage of poetry or something that goes along with our studies. We also, almost always, read something from WORLDkids magazine, formerly God’s World News. 1) We have conversations we would never have had otherwise, about stuff that is true and only recently happened. These conversations help to formulate my kids’ worldview. Relevant bible verses are often integrated at the end of a news feature, to aid parents. 2) WORLDkids rocks my kids out of their comfy, suburban-American life, to help them realize the real struggles other people have in different parts of the world. 3) WORLDkids helps grow my kids’ imaginations regarding how they could contribute positively to society, whether it be through a service project or invention and technology. It exposes my kids to other people’s creative ideas and gives them fodder for their own ideas. 4) WORLDkids is also great for subtly adding in extra subjects, like geography. We often look at the map to see where the events we read about take place. But it’s not just geography. 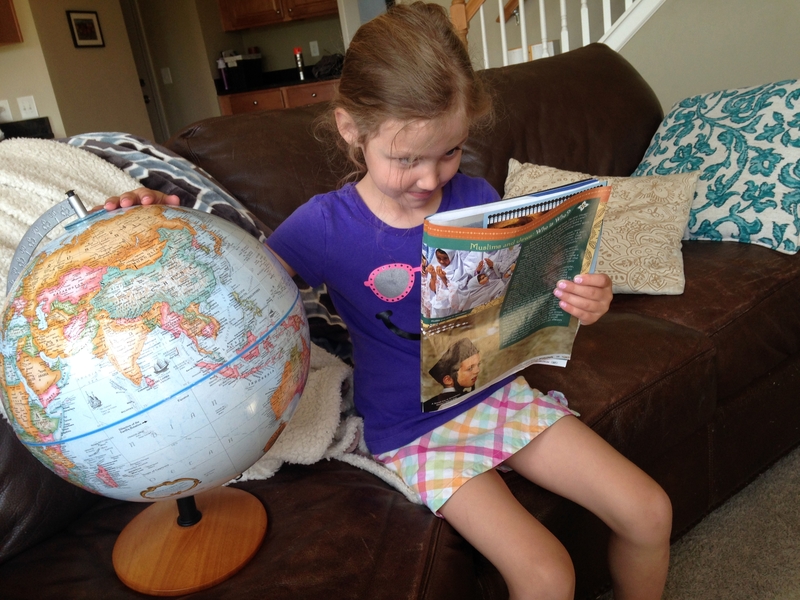 WORLDkids covers history, science, and more. 5) Sharing current events stories and conversations helps to foster more closeness in our family. My kids often come to me later with subsequent questions. One conversation we had a while back involved some girls who live in India where there are no school buses or good roads for them to get to school. These girls have to actually put their books and a change of clothes into a plastic bag and swim across a river to get to school. My kids were incredulous. They learned that they should not take education for granted. We also read about children who wanted to understand the food growing process and raise money so they planted a garden of tomatoes and made salsa to sell. I could see my kids’ mental wheels turning. We just recently read about humans helping animals in the wild and the kids had to think about the pros and cons of human intervention in nature. Sometimes there is no apparent good answer, which is definitely a real-life conundrum. I love all these discussions and I love seeing my kids think and begin to form their own opinions. Teaching current events and worldview go hand-in-hand. WORLDkids is a win-win in our home.